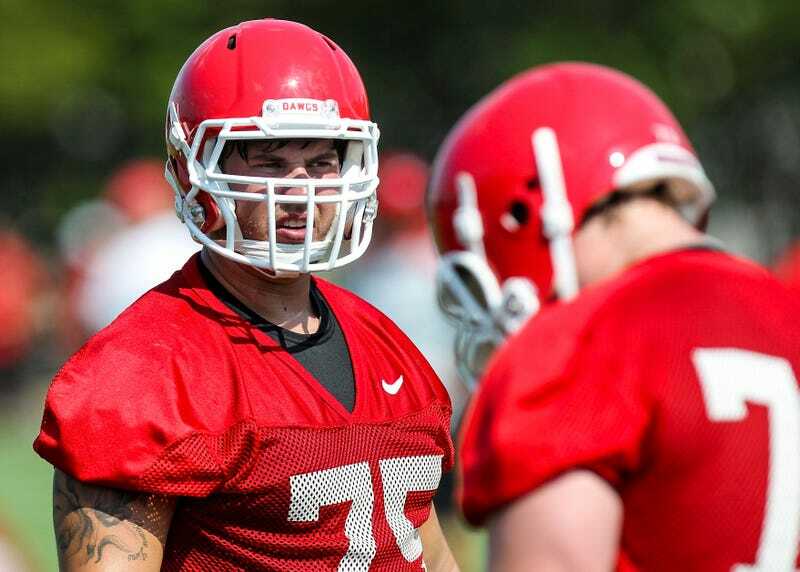 Georgia lineman Kolton Houston failed an NCAA drug test during his freshman season in 2010. He then failed dozens more in the three years since. Now, finally, Houston's been cleared to play by the NCAA. ESPN's Outside the Lines ran an excellent piece on Houston in May, and it's really worth watching, but here's the short version: Houston failed a random NCAA drug test when he got to Georgia as a result of a medically prescribed steroid injection to recover from a high school injury; he failed dozens more over the next three years, including a second NCAA test that earned him a lifetime ban from collegiate competition, as Georgia's drug testing program tried to prove that he was the victim of medicine gone wrong; and Georgia was rebuffed by the NCAA—with president Mark Emmert writing that he was "surprised" the school was taking up for Houston—when it tried to make a case for an exception that would get Houston on the field. Houston's lifetime ban was turned into a competition ban as a result of Georgia director of sports medicine Ron Courson establishing that he did not re-use steroids, but Houston, who resorted to elective surgery to try to remove fatty deposits that trapped the steroids, still had to wait until his results showed a level of 19-norandrosterone, a metabolite of nandrolone, below the allowable NCAA limit. "This is the best birthday present I've ever had. I had almost reached the point where I thought this situation would never end. When I got the call, I broke down and cried for about 30 minutes. I had that much emotion stored up and it felt good to get it out. I'm ready now to show what I can do." Houston is likely to join Georgia's rotation at tackle, but has just two years of eligibility remaining. Here's hoping he becomes a constant reminder of how dumb the NCAA is.